By combining these features, users can model many functional workflows. More specific workflows can be programmed in a project context using the AxCMS.net extensibility model. In the simplest case, a single person performs all the tasks on the web site. In this case, this person creates a page and edits it until everything looks good (the new page is only visible in Management System, not the Live System). Then she clicks "Publish" and the page is published to the Live System. 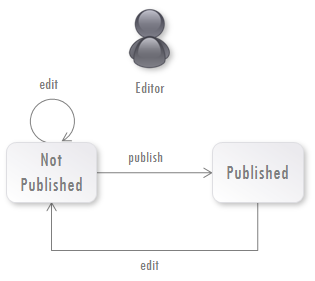 In a more complicated model, the role of editor and publisher are separate. An editor can make changes, but cannot publish herself. There is a special role of a Publisher, who can publish. 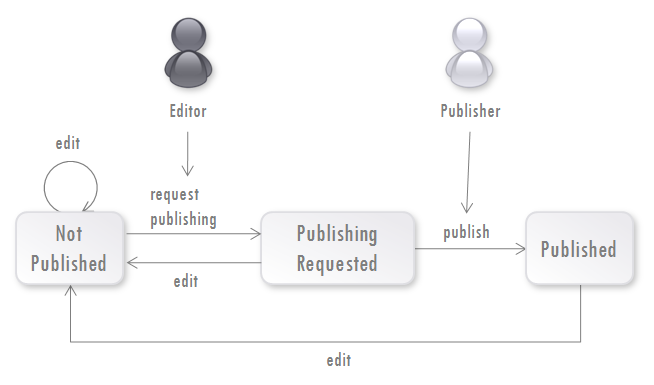 In this scenerio, when the editor has completed making changes to a Page, she will click "Request Publishing" instead of clicking "Publish". The page is then in the state "publishing requested". The Publisher can then review the requested page and publish it or refuse to publish and inform the Editor about the problems. If more than one party needs to be involved in reviewing the Pages before they go live, the role of a Controller can be introduced. 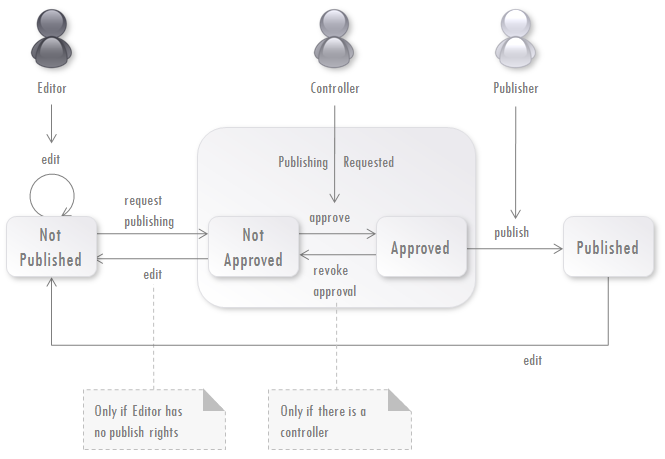 If a Controller is defined for a page, she has to approve the Page before it can be published by the Publisher. There can be one or multiple Controllers. Every Controller can approve the page from her own perspective, e.g. Corporate Identity, Legal, etc. With Workflows it is important that every user is informed about the next steps she can/should take for every particular workflow. To facilitate this, AxCMS.net offers 3 methods: Reports, Alerts and Filters. Alerts are similar to reports, but they are triggered immediately when something happens. For example, if an editor requests publishing, an Alert "Request Publishing" Alert is triggered for this page. The users, which have subscriptions to this Alert immediately get email notifying them of the request. Because Alerts, if applied globaly, can generate huge amounts of email traffic on a busy web site, there is the ability to restrict them. When subscribing to an Alert, you specify a Category for which you want to have Alerts. You are then informed only about the events from the objects in this category and below. Custom alerts are possible in a project context as well as the custom reports. Both Alerts and Reports are part of the push-communication in AxCMS.net - the user getting notifications from the system. There is also the capability for pull-communication. If a user logs into the management system, she can easily find the next relevant workflow steps. 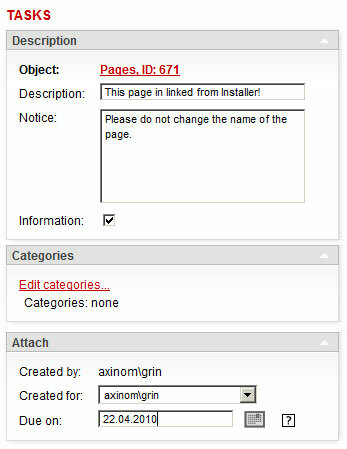 On Page and Document overview pages there is a box labeled "myStuff" which allows the user to filter for relevant objects (objects for which the user has permissions to perform the next action) and/or the objects with a particular pending workflow step ("need request publishing", "need publishing"). On the start page in the management system, a user can configure special boxes which also show the objects in a particular workflow step. For example: "All changed pages which need to be published and can be published by me". AxCMS.net applies versioning to Pages and Documents. It differentiates between major and minor version changes. A major version is created when an object is published. A minor version is created on every object change. User can view all the previous versions and even restore any of them with one click. AxCMS.net tracks dependencies between objects and reminds the user if needed. For example, if a user tries to publish a page, AxCMS.net will show which images are embedded and not published yet, as well as relations, navigation nodes and all other objects the current page depends on. If a user tries to delete a document, it will show all other objects which depend on this document and will enquire whether the user really wants to proceed with deletion. A user can also review the dependencies at any time. AxCMS.net supports collaborative work of many editors on the same Page. To prevent conflicts (for example, one user overwriting the content written by another) it uses Check-In/Check-Out concept. If a user starts editing an object in a page, that object is automatically checked-out for the current user. As long as the user edits the object, the others can see it, but cannot save back their changes. When the user has completed her editing, she checks it back in. It is only possible to publish a page when all content on the page is checked in. An Administrator can check-in forgotten objects, if the user who checked them out is not available. Tasks can be assigned just by emailing task description to the AxCMS.net Instance. A typical task in a multi-language application is the translation of the content into different languages. AxCMS.net supports external Translation Tools via a special API. 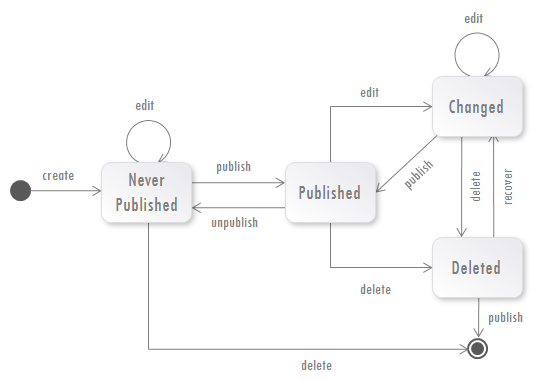 Calling this API can be added into a normal publishing workflow. Just click on a Page, then "Translate page", select the target languages and "finish". Copies of the page are created and assigned to the selected languages. The content is exported as XML and forwarded to the translation API. As soon as the translated version is ready, AxCMS.Service picks it up and imports it into the Page. There is a reference implementation for Across Language Server, but any other translation engine is possible with a few customizations.